As UTT has reported on numerous occasions, for both the Global Islamic Movement and the Marxist/Socialist movement, the primary focus is in the information domain (propaganda, deception operations, etc). For the Global Islamic Movement’s leading edge – the Muslim Brotherhood – their methodology is “Civilization Jihad” by OUR hands. They get our leaders and key organizations to do their work for them. Getting the U.S. State Department to write the constitutions for Iraq and Afghanistan (2005) which created Islamic states under sharia – thus fulfilling Al Qaeda’s objectives in those nations – and getting a four-star U.S. general (Petraeus) to go on international television to condemn a U.S. citizen for exercising his First Amendment rights to burn a book (the Koran) – thus enforcing the Islamic law of “Slander” – are two simple examples. At the Democratic National Convention, Khizr Khan played his role knowing full well there would be a predictable response from Mr. Trump. A response for which our enemies were prepared. Republican leadership and people in the Trump campaign did not even have fore-knowledge of Mr. Khan’s participation in the convention and, thus, did not do their due diligence or conduct a basic background investigation on Mr. Khan to prepare for a response. Mr. Trump made statements regarding Mr. Khan and his wife, and the trap was sprung. It was not Hillary Clinton nor the Democrat Party that fired the first salvo at Trump Headquarters. Mr. Trump was hammered by Gold Star mothers, the VFW, Republican leaders, and others. This was a home run for the enemy. This is warfare in the information domain. This is “political warfare,” and is never done willy nilly. It has purpose, and is a part of a larger strategy. There is also an abundance of evidence Mr. Khan is an agent of a foreign power (Pakistan) who just conducted an extremely well-executed information operation against a U.S. Presidential candidate. All the players responded as predicted, and all patriotic Americans should be gravely concerned. If the Trump campaign does not figure this out quickly, his supporters will be separated, pitted against each other, and dissipated. The enemy is engaging in the information warfare battlespace, and the Trump campaign appears oblivious to it. In 2012, Michele Bachmann courageously led the charge in Congress and put forth evidence from the largest terrorism trials in American history revealing massive Muslim Brotherhood penetration of the federal government. She called for key Inspector Generals offices to investigate. The attack on her came from Senators Marco Rubio and John McCain, and other prominent Republican leaders. Civilization Jihad by OUR hands. This is, by the way, in direct contradiction of American law and government, the foundation of which are the “Law of Nature” and “Nature’s God,” not sharia. 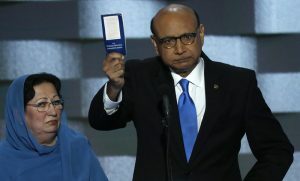 Americans should know this the next time Mr. Khan waves a copy of our Constitution in our faces. For more on “Sharia” see the UTT article HERE. If we are to truly understand the threat we face from the Global Islamic Movement and the Marxist/Socialist movement, we must know their primary battlefield is in the media, not on a piece of open ground on which tanks and troops engage each other. The American people do not understand propaganda and its purpose. This piece explains the true battleground which is “the mind”. For all our sakes, we need to stop our addiction to entertainment and focus on reality before we are overwhelmed. Zawahiri’s “media battlefield” letter failed to make clear that the “half” it alludes to is mainly comprised of Dawa jihadists abetted by U.S. presstitutes seeking to supplant our Constitution with Sharia to, thus, amend the Bill of Rights to accommodate Islam. Which is probably what the vanguard of Muslim Brotherhood operatives were focused on when they became established in Urbana. Furthermore, given that said presstitutes used a staunch, sharia-adherent, ranting decoy to wave “his” copy of the U.S. Constitution at the recent Marxist Party Convention (I.e. to emphasize his expertise regarding the Declaration of Independence & the 14th Amendment) must have been napping at Harvard when “illegal immigration” & “illegal” per se were being discussed. John McCain appears to regard the Military Industrial Complex as an insatiable stocking-stuffer vis-à-vis tenure, And Michelle Bachmann took the brunt of his moral cowardice, which he cannot deny. Too bad the enemy sucker punched Trump like that. Makes me wonder if he has the skills necessary to wage the fight. Even if he doesn’t, he’s not necessarily worse than Hillary, since by all accounts Trump at least understands the problem and is willing to try. (Caution though, sometimes incompetence is worse than outright duplicity.) I’ll take my chances and vote for him, given what I’m seeing now. IGNORANCE OF ISLAM’S UNDERLYING DESIRE TO DOMINATE COMPLETELY IS WESTERN CIVILIZATION’S GREATEST WEAKNESS ! !